After the capture of Philadelphia on September 26, 1777, and of the failure of the American surprise attack against the British camp at the Battle of Germantown on October 4, the Americans tried to deny the British use of the city by blockading the Delaware River. To that end, two forts were constructed commanding the river. One was Fort Mercer on the New Jersey side at Red Bank (now National Park, New Jersey). The other was Fort Mifflin on Mud Island, in the Delaware River just south of the confluence of the Schuylkill River, on the Pennsylvania side opposite Fort Mercer. So long as the Americans held both forts, the British army in Philadelphia could not communicate with the outside world or be resupplied. In addition to the forts, the Americans possessed a small flotilla of Continental Navy ships on the Delaware supplemented by the Pennsylvania State Navy, all under the command of Commodore John Hazelwood. On October 19, General Sir William Howe, the commander of the British army, evacuated his camp at Germantown and pulled his forces inside the city of Philadelphia. He sent a part of his force to capture the two American forts denying him use of the Delaware River. 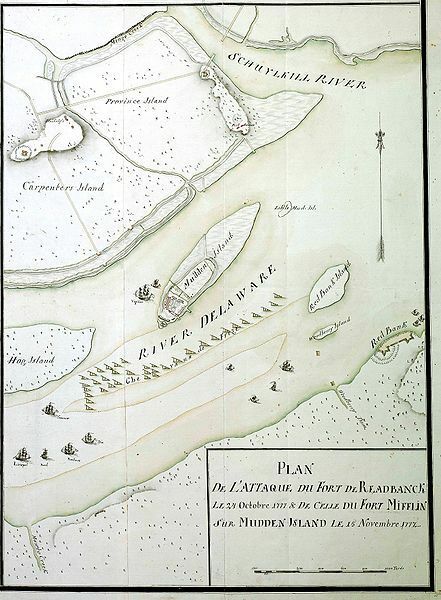 Earlier, Howe had sent a group of men via Webb's Ferry, at the mouth of the Schuylkill River, to marshy Providence Island (actually on the Pennsylvania mainland by Mud Island) to construct artillery batteries to bombard Fort Mifflin. The first bombardment of Fort Mifflin came on October 11. This was merely a desultory attack which convinced the British to expand and improve their batteries. Meanwhile, 2,000 Hessian troops under the command of Colonel Karl von Donop landed at Cooper's Ferry in Gloucester City, New Jersey, about four miles (6 km) upriver from Fort Mercer, and made preparations to attack the fort, located on the high ground at Red Bank. Von Donop, who had had three regiments defeated and captured nearly a year earlier at the Battle of Trenton, was eager to avenge what he considered to be a humiliation. He declared to his men: "Either the fort will be called Fort Donop, or I shall have fallen." Von Donop divided his force into two groups totaling 1,200 men for a two-pronged attack upon the fort on the morning of October 22. Von Donop and Hessian grenadier Lieutenant Colonel von Linsing were to attack the southern part of the fort, while Colonel Friedrich Ludwig von Minnigerode's grenadiers and Lieutenant Colonel Werner von Mirbach's infantry were to attack the northern and eastern approaches. With six British men-of-war in the river to support the attack, von Donop was convinced that the fort would be in his hands by nightfall. After a cannonade by the Hessian artillery, Linsing moved against the nine-foot-high southern parapet, and his men were cut down by devastating cannon and musket fire and were forced to retreat. On the north, Minnigerode's grenadiers managed to scale the ramparts of an abandoned section of the fort. But when they moved on they were confronted by a tangled mass of felled trees with pointed branches, a kind of abatis, protecting the main wall of the fort. With little in the way of proper tools, they were soon spotted trying to claw their way through the barricade and were fired upon by the Americans waiting for them on the other side. Suffering heavy casualties, the Hessians began to retreat, falling back to their camp ten miles (16 km) away in the village of Haddonfield whence they had come. Von Donop was wounded in the thigh during the southern attack and was left on the battlefield by his retreating troops. Mortally wounded, von Donop died three days later in the Whitall House, a farmhouse just outside the southern works of the fort between the fort and Woodbury Creek. To make matters worse for the British and Hessians, the six British men-of-war were engaged by smaller American gunboats. During the engagement, two of the ships, the 64-gun man-of-war Augusta and the sloop of war Merlin ran aground on a shoal trying to avoid a series of underwater obstacles called chevaux-de-frise or stockades, which were rows of large wooden spears weighted down on the bottom of the river by heavy crates filled with rocks, designed to pierce the hulls of intruding British warships. The next morning, unable to drag the Merlin off the shoal and not wanting to let the ship fall into American hands, the British set fire to the ship, while the Augusta was set on fire by American batteries from Fort Mifflin. The Augusta exploded the next day. On October 21, Howe had detached Col. Carl E.K. von Donop from the main British army. The force of von Donop comprised of a 2,000-man brigade The command was made up of 4 companies of the Hessian jager Corps, 3 battalions of Hessian grenadiers, the Regiment von Mirbach, and 2 guns. They decided to camp at Haddonfield until the next morning. On October 22, at 3:00 A.M., the British moved out of their camp and started their march on Fort Mercer. Seeing the advancing British force, Jonas Cattell, an apprentice blacksmith, alerted Greene that a surprise attack was imminent. Around noon, the British approached the fort. Around 4:30 P.M., Von Donop sent one of his officers to Greene and demanded the American garrison to surrender. The threat of "no quarter" was also made. Greene declined the surrender offer and prepared his men for an attack. Around 9:00 P.M., the British began their attack. The Von Lengerke's Battalion and the jagers were assigned to protect von Donop's flank and rear, while von Donop got the rest of the Hessians to attack the fort in 2 columns. One column consisted of 2 grenadier battalions and the ?? Von Mirbach from the north and the second column consisted of Von Donop and the remainder of the Germans coming from the west. 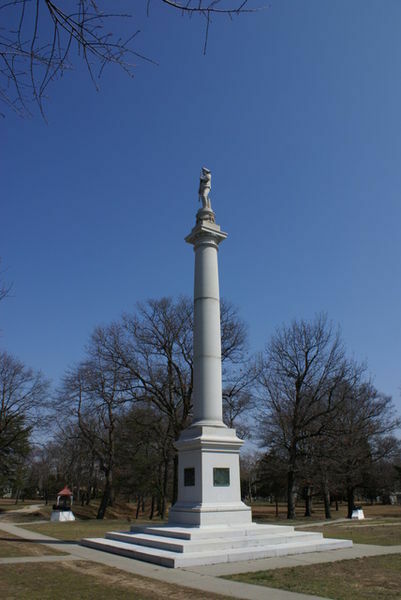 The northern column stormed the fort's breastworks while shouting "Vittoria!". Quickly gaining the old northern section of the fort, the Hessians faced another 10 foot wall and abatis of sharpened tree trunks and branches. The disordered Hessians tried to move forward, but the Americans gained the advantage and held the fort. The western column attacked through the abitis and across the ditch. Once there, Von Donop find himself stopped at the berm because his column did not have any scaling ladders to climb assault the parapet. Up to this point, his plan had worked perfectly and the Americans had not even fired a shot. Greene ordered his men to open fire with both musket fire and cannon fire. They fired on the Germans at point blank range, butchering them mercilessly. Von Donop was struck with in the leg, a wound that would later prove to be fatal. The Germans withdrew and reformed for a second attack on the south side of the redoubt. They were again stopped by musketfire from the fort and also from the American galley ships on the river. Hessian casualties amounted to over 500, including the mortally wounded Von Donop; while American counted 14 killed and 23 wounded out of 600. Many of the wounded, including Von Donop, were taken to the Whitall house where they were tended by American doctors and Ann Whitall, who had remained in her home. Von Donop died in another house nearby and was interred with remains of his brigade on the battlefield. The Hessian army reported casualties of 377 killed and wounded with 20 missing or captured, while the Americans reported their losses at 14 killed and 27 wounded. Frustrated by the failure to capture Fort Mercer, Howe ordered the Hessian regiment withdrawn from New Jersey while he made plans to attack Fort Mifflin by a massive artillery bombardment. By early November the British artillery batteries on Providence Island were complete, and a number of warships were available in support. On November 10, 1777, the British opened a full-scale bombardment of Fort Mifflin which lasted for five days. Six British warships, with two small floating batteries, the Vigilant and the Fury, also joined the bombardment to rake Fort Mifflin at close range. After five days, on November 15, the commanding officer of Fort Mifflin, Major Thayer, with 250 reported casualties among his 400 men and with ammunition running low, abandoned the fort that evening, leaving the American flag flying, and evacuated his men to Fort Mercer. The next morning a small party of British troops landed unopposed at deserted Fort Mifflin, hauled down the American flag, and ran up the British Union Jack atop the ruined fort. The bombardment of Fort Mifflin cost the British only a reported 13 sailors and troops killed with 24 wounded, with some damage done to some of their warships and land batteries. Howe then sent Lord Cornwallis with 5,000 men to attack Fort Mercer, landing them by ferry at Billingsport, three miles to the south. Rather than let the garrison be captured in an overwhelming British assault, Colonel Christopher Greene decided to abandon the fort on November 20, leaving the British to occupy it the following day. George Washington's scheme of starving the British out of Philadelphia had failed with the loss of the two forts. His only hope now was to lure the British out of Philadelphia into another major land battle at his camp at nearby White Marsh. Although Howe did sortie from the city to launch a feint at the American camp in early December, he felt the American position was too strong and retired to Philadelphia for the rest of the winter. Washington then moved his army to Valley Forge to overwinter.